Today was all about getting to know downtown Split. 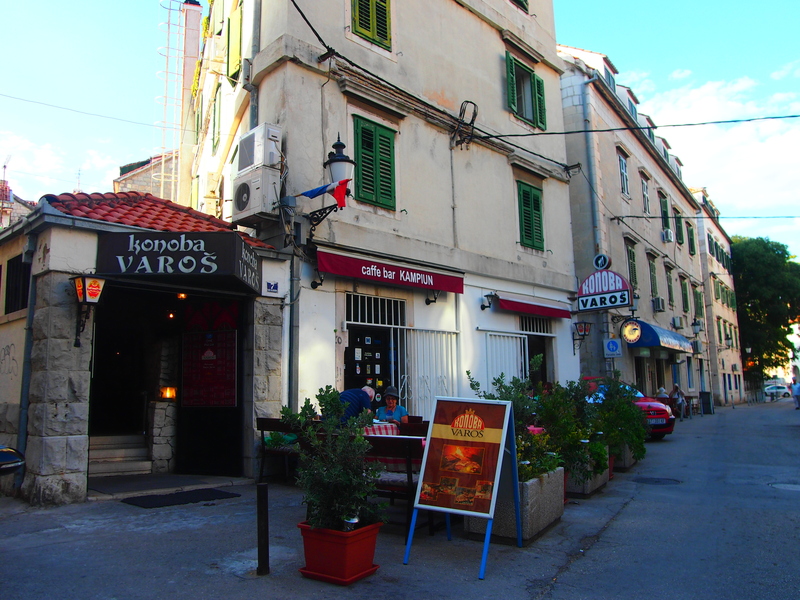 The first place we visited was Radunica Street which is a street east of the Riva in the center of Split. It is a narrow street with very fascinating old stony houses. The name of the street comes from an ancient Illyrian name “Radun” which means water spring. Radunica is the main street and it’s side streets are named after the last names of families who gathered there about 500 years ago. Interestingly enough there is a ceramic little fountain where you can refill your water supplies and the source most probably comes from a spring. We visited the place at the very best time of the year because it was the time of Days of Radunica which means you can listen to street music in the evenings and see beautiful decorations hanging with between buildings. The Days of Radunica usually take place in the last week of June and while talking to a local lady living in the street we found out that Saturday is the most festive day during that week. On Saturday they play a game similar to bingo and anyone can buy a ticket to participate and have a chance to win a prize. They also have some fireworks and give out free grilled sardines with bread and tasty wine. The atmosphere is very welcoming and the people are super fun! While we were strolling down the street we also met a local man named Nikola. He was a very talkative man with expressive gestures and we soon enough found out he lived in Italy for 5 years which explains everything.He had some interesting stories to tell us even though his English and Italian wasn’t top notch. He introduced us to a side street in the Radunica called Kukoča Ulica which is named after the famous Croatian basketball player Toni Kukoč who is a native of Split. Towards the end of the street we met a man who was in a hurry but was still nice enough to find some time for us to explain what Radunica is all about. He said he was actually from Varoš but in the olden days people from these two districts used to compete with each other. Like neighbors trying to be more impressive than the other, they would always try to make better music, have a greener lawn or a bigger grill etc. The Dioclecian Palace is surely the main attraction in the historical part of Split. Since it is so capacious and full of rich history, we make a separate post about the Dioclecian Palace! Near the Golden Gate (north side) of the Dioclecian Palace stands a large statue of Gregory of Nin who was the bishop of Croatia in the 10th Century AD. 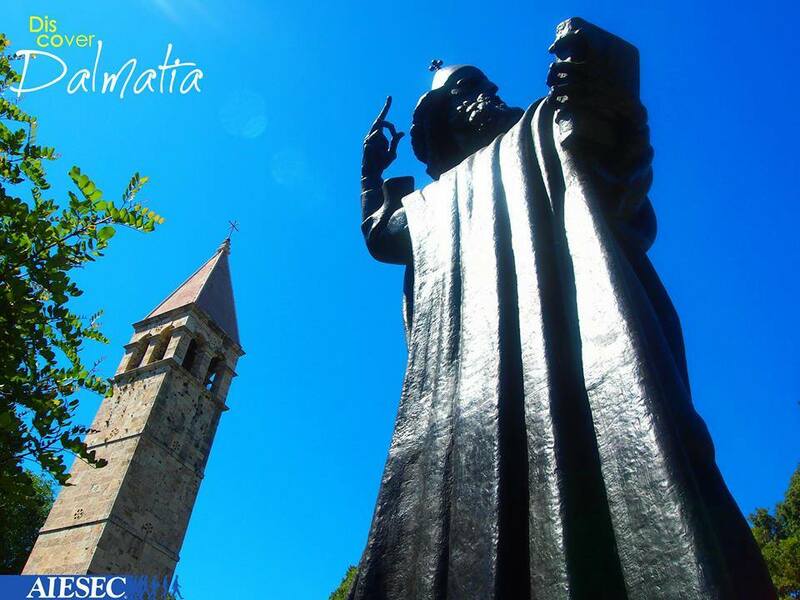 He was the first to introduce the native language to the mostly Latin church which was very welcome to the local people because most of the people in that period didn’t speak Latin. It is also a good idea to rub his big golden toe for good luck. On the southern side of the Dioclecian Palace by the sea is the beautiful Riva Promenade for walking, buying souvenirs, a bite to eat, resting your feet in a café or just enjoying the view on the harbour and the sea. The Riva Promenade was shaped as it is during the rule of Napolen a few centuries ago. On the western side of the Riva is a little dock for boats and is a popular place for young people in the evenings and socializing. The place is called Matejuška and you can recognize it easily because it has Matejuška written on it and you should see it by if you’re walking towards Marjana by the sea. You can get to the Varoš district if go west of the red building of the Republic Square and just start going uphill while keeping to the west. It is a district similar to Radunica with old and stony houses but it leads uphill to the Marjan hill and has interesting benches for resting which can remind you of mushrooms from Super Mario. If you’re already visiting Veli Varoš you have to visit the Marjan hill because the view is amazing! It might be a tiring after a long day but it is worth for the view on the centre of the city. Up the hill lies the Chapel of St. Nicholas who was the favourite saint of fishermen. The Marjan hill has a good trail for hiking around the whole peninsula of Marjana with good overview on the islands that surround the peninsula and you can enjoy the natural Mediterranean pine forests which fill the peninsula. PS! If possible, visit the Marjana hill in time for sunset.